London, Wigmore Hall, 27 March, 1997: At a reception following the memorial concert for Berthold Goldschmidt, who had died a few months before, I meet an elderly lady. "My name is Margaret Reizenstein, I don't suppose you'll know who my husband was ...". Those were the first words of our conversation, during the course of which we soon discovered areas of shared interest. Had not Berthold Goldschmidt himself spoken several times of Franz Reizenstein with great appreciation, a man who had left Berlin for exile in Britain just as he himself had done? That encounter with Margaret Reizenstein not only gave me deeper insight into the work of her husband, but what is more, Margaret Reizenstein helped produce this CD with her gratuitous support in every respect and with precious information, for which we would like to express our warmest thanks. Franz Reizenstein was born in Nürnberg on 7 June, 1911 as the youngest son of the physician Dr Albert Reizenstein and his wife, Karoline Kohn. In the assimilated Jewish household, music and the arts played an important role. His parents played the piano and in addition his father devoted himself to painting, the occupation which Franz Reizenstein's elder sister, Liselotte, later chose for her profession. Franz Reizenstein's extraordinary talent became evident early on, pointing to his future as both a composer and a pianist. In 1930, he took up study at the Musikhochschule in Berlin under Paul Hindemith (composition) and Leonid Kreutzer (piano). All his life Reizenstein declared himself an admirer of the aesthetics of Hindemith's middle period, whose deliberate return to tonality in connection with a mastery in counterpoint, as well as his practical know­ledge of almost all instruments were influential benchmarks for Reizenstein. According to his pupil David Wilde (Recorded Sound, The Journal of the British Institute of Recorded Sound No. 76, October 1979), Reizenstein remarked on Hindemith's Ludus tonalis: "This is like a Credo to me." Hindemith's composition class, members of which included Harald Genzmer, Oskar Sala and Arnold Cooke – the latter remaining a lifelong friend of Reizenstein, who had his piano concerto in his repertoire – moved between traditional compositional techniques and intense practical exploration of early music on the one hand and natural handling of the new media of radio, film and mechanic sound generation on the other. Hindemith must have appreciated the works of his pupil, for at the presentation evenings of Hindemith's composition class Reizenstein's works were, after Harald Genzmer's, performed more often than those of the other students. Thus the presentation evening of Hindemith's composition class on 27 February, 1933, was entirely devoted to works of Genzmer and Reizenstein; Reizenstein even played the piano (see 54. Jahresbericht der Staatlichen Akademischen Hochschule für Musik in Berlin). "He was a fantastic pianist and met me once in Munich to present a work for viola and piano to me", wrote Harald Genzmer, by the by recalling his former fellow student in a letter to the author dated 25 August, 2001. Indeed, Franz Reizenstein made early appearances as a student of Leonid Kreutzer at the Musikhochschule in Berlin with masterpie­ces of the piano repertoire ­– on 29 February, 1932, he performed Max Reger's Variations and Fugue on a Theme by J. S. Bach op. 81, on 11 February 1933 Beethoven's Sonata op. 106. Reizenstein's affinity with Hindemith's works is already shown in a performance of his Klaviermusik op. 37 (the second part) at a presentation evening in the piano class of Leonid Kreutzer on 16 July 1932. A few years later, Reizenstein performed Hindemith's three piano sonatas for the first time in London. In 1934, when Franz Reizenstein decided to leave Germany due to the political situation, an uncle on his mother's side, who had emigrated to England around 1900, offered him accomodation in Kingston, Surrey. Reizenstein soon went to London where he continued his study of composition under Ralph Vaughan Williams at the Royal College of Music until 1936, a step that was to become crucial for his later integration into musical life in England. The Suite op. 6 for piano, dedicated to Ralph Vaughan Williams, was published as Reizenstein's first work by the leading English music publisher, Boosey & Hawkes. From 1938 to 1940, Reizenstein complemented his piano education with private studies with Solomon; from 1941 to 1945, he worked as a train conductor due to being unfit for active duty but was nonetheless able to continue to work as a composer and pianist. Reizenstein's bonds to England were further deepened by his marriage to the English music critic Margaret Lawson in the year 1942. Following the war, he wrote not only large-scale works such as the cantata Voices of Night op. 27 (1951), the radio opera Anna Kraus op. 30 (1952) and the oratorio Genesis op. 35 (1958), but also showed his versatility in various genres such as film music and popular music. With his witty, brilliant contributions for Gerard Hoffnung's festival ­Concerto popolare and Let's Fake an Opera ­Reizenstein became almost a classic of humorous music for entertainment. The success of both works even became independent of their author, whose real focus as a composer was instrumental music, in particular chamber music. As a pianist, Reizenstein also made chamber music a vital part of his work in the years following the war. Together with the violinist Maria Lidka, who came from Berlin, and the cellist Christopher Bunting, he formed the Reizenstein Trio and also performed with two violinists who had emigrated to England as well, Max Rostal and Erich Gruenberg. In the fifties and sixties, Franz Reizenstein was repeatedly invited by the radio station Bayerischer Rundfunk for studio recordings, particularly of his own works. Those recordings became important for Reizenstein as they re-established a connection to his hometown, Nürnberg. In 1958, Reizenstein was appointed professor of piano at the Royal Academy of Music, and from 1962 onwards he taught piano at the Royal Manchester College of Music as well. In 1966, he was a guest professor of composition at Boston University and he conducted evening classes for non-professional composers at the Hendon College of Technology. In her book on musicians persecuted by the Nazis (Hamburg: von Bockel 1996), Jutta Raab Hansen proved that Franz Reizenstein, like Max Rostal, was appointed professor to reputed institutions relatively early compared with other noted musicians in exile in England. For example, Walter Goehr or Berthold Goldschmidt never gained positions of that kind. Reizenstein's versatile work as a composer, pianist and teacher was cut short abruptly and all to early by his sudden death on 15 October, 1968. His music, though not forgotten, still deserves attention. Having been neglected in Germany, in particular during the last decades, it should, however, be considered as part of a new, ideology-free assessment of music history in the twentieth century, with special respect to relations between England and Germany brought about by those who went into exile. Although Reizenstein's actual musical career began in England and he considered himself rather an English composer, it appears that his four years of study during the early 1930s in Berlin were decisive for his whole output. Reizenstein began his study in Berlin during a period when the pioneering and experimental spirit that had characterised the music of the 'Golden Twenties' was already decreasing. A certain matter-of-factness in view of all the diverging tendencies mingled with growing economic worries, which, as a consequence of the world depression, worked in favour of the Nazi propaganda. Hindemith's compositional development between 1920 and 1930 particularly reflects this process of a gradual return to traditional patterns as well as the composer's endeavour to apply a new aesthetic fundament to his own works (and those of his pupils) through a theoretical concept. Hindemith's aesthetic concept and his natural way of handling compositional problems and various instrumental media had been a major influence on Reizenstein. Even while still a student in Berlin he divided his creative work between writing music and playing the piano, a coincidence that was to become a characteristic in later years. Early on, Reizenstein showed a preference for the great, monumental works of the Romantic piano repertoire. At the same time, the annuals of the Berlin Hochschule für Musik 1931–1933 testify to Reizenstein's advocacy of the works of fellow student Harald Genzmer, as well as of his own. His later repertoire of piano concertos shows a very individual predilection in the realm of twentieth-century music: besides the concert pieces of his teachers, Hindemith and Vaughan Williams, he performed his own two piano concertos and the one of his fellow student Arnold Cooke. Works by Debussy, Honegger and Milhaud, on the other hand, reveal Reizenstein's affinity with French music, which has left its mark on his own compositional output. All his life Reizenstein gave attention to the genre of the sonata; ­by coincidence, it seems, two sonatas for unaccompanied string instruments form the beginning and end of his oeuvre which mainly includes piano and chamber music. In 1931, he wrote the Sonata for Cello solo as his op. 1, performed for the first time at a presentation evening of Hindemith's composition class at the Musikhochschule Berlin on 7 July, 1932. More than thirty years later, it was revised by the composer and published as op. 44. The Sonata for Solo Violin op. 46, finalized on 23 July 1968, is the last composition Reizenstein was able to complete. 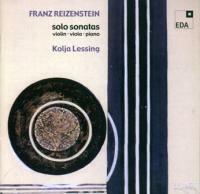 Since Reizenstein based his sonatas on various outlays of form and, with the exception of two piano sonatas, wrote only one for each instrument or set of instruments (without, however, covering every instrument in a quasi-encyclopaedic fashion like Hindemith), the three sonatas juxtaposed in this recording are especially revealing as they show Reizenstein's profile as a composer in the field of tension between the German style and English and French influences, between late-Romanticist piano tradition and genuine exploration of the sounds of instrumental media, which were unfamiliar to him. Reizenstein's Sonata in B for Pianoforte op. 19, written in 1944 represents his first large-scale work for piano. In its formal conception, its artistic contrapuntal texture and its colourfulness iridescent between the different registers of sound, it shows Reizenstein's significance both as a composer and as a pianist. While the dedication to William Walton as a sign of respect to an older, much more famous fellow English composer, whose style in some respects resembles Reizenstein's, the compositional standard of the Sonata in B directly refers to German Romanticist piano tradition. A weighty introduction in B minor, in an extemporising manner, opens the first movement, whose main part – a highly virtuoso Allegro vivace ­– entirely follows the classical sonata form. This Allegro vivace begins with a sprightly first theme in E flat; the main key of the movement, B, is only confirmed in the extensive melodic second theme. Moments in which sound unfolds to full scope alternate with playful, transparent episodes, toccata-style continuity is roughened by jazz-inspired, rhythmic-metrical shiftings and counter-accents. In the second movement, whose main key is D major, the relative major of B minor, a striking contrast to the turbulent first movement is being created. The movement is a cosmos of touching simplicity; its two dominant themes, sharing similar motifs, continually shine during the movement, subtly modified by changing harmonies. They impressively reveal the composer's sense of sound, which, far from the dryness of some German piano compositions of the thirties and forties, has been developed through his study of English and French models. In the final movement, again opened by a slow introduction, Reizenstein inventively combines formal elements of the rondo and the fugue, both of which are typical of final movements in German sonata tradition since Beethoven. In the course of the movement, the initial slow introduction appears shortened as a rondo refrain, each time followed by fugue sections of different character. In his playful, almost virtuosic, disguised mastery of counterpoint, Reizenstein betrays a musical heritage which, shaped by his study of Beethoven, Reger and Hindemith, can be seen as typically German. On the other hand, though, Reizenstein's pianistic style, which is characterised by a great sense of colour and sensibility of sound (a trait looked down upon in Germany for decades under different ideological verdicts), reveals a clear distance to the work of his revered teacher, Hindemith. ­Indeed it shows a remarkable personal synthesis of various influen­ces, whose roots include Reizenstein's own practical approach to the piano. Reizenstein's Sonata for Viola solo op. 45, written in 1967, is marked by abundant contrasts and sophisticated sound patterns. Its four movements, short though they are, achieve amazing spatial effects. The opening movement especially, which is designed as a virtuoso piece and follows the traditional sonata form, shows Reizenstein's unfailing ability to create a magical atmosphere and a sound design developed from the individual instrument. In the development section, a kind of imaginary dialogue unfolds between passages played in a 'usual' manner and reminiscences to the second theme in a remote flageolet sound. Although the first theme already soars up over the pedal point C at the very beginning of the movement, the central role of that note is not confirmed until the end of the recapitulation, when the second theme reappears and harmonic resolution reaches C major. The middle movements contrast with each other but are unified by underlying song elements whose basic unit is an F minor triad in the second movement and an F major triad in the third movement. The second movement, which is structured in verses and set in a polyphonic style, has an elegiac, nostalgic character due to its suspension figures reminiscent of baroque rhetorical style. The third movement, played almost completely pizzicato, turns out to be a humorous intermezzo, an almost ironic virtuoso showpiece. In the finale, inspired by dance, Reizenstein combines elements of the rondo form with aspects of the sonata form, which becomes obvious in the polarity of the first and second themes. A spacious five-part C major chord concludes the sonata which – thanks to the originality of its four very different movements and their individual, characteristic sense of colour – deserves a central position in the repertoire for solo viola. Between January and July 1968, Reizenstein wrote his last completed work, the Sonata for Solo Violin op. 46. Its five-movement structure is reminiscent of Emil Bohnke's Sonata for Solo Violin op. 13 No. 1 and also of Paul Hindemith's Sonata for Solo Violin op. 31 No. 1. Though the order of the movements concerning time, fast­-slow-­fast-slow-­fast, corresponds with Hindemith's op. 31 No 1, this may be accidental. The Sonata for Solo Violin, Reizenstein's compositional legacy, reveals how deeply he was rooted in a polyphonic tradition marked by the names of Bach, Reger and Hindemith. The first movement unfolds with a sweeping gesture of an extemporizing character; like the fourth and fifth movements, which are closely related motivically, the first is dominated by the key of G minor, chosen in analogy to Bach's Sonata I in G minor for Solo Violin BWV 1001. However, there is a further parallel between Reizenstein's Sonata and the one of Bach. Reizenstein's second movement is designed as a pastorale in B flat major, following (possibly without the composer's awareness) the example of Bach's Sonata whose Siciliana in B flat major, related by a third to the key of G minor, has the same character. With respect to Reizenstein's exile, those moments of reflection on Germany's musical heritage gain special significance, in particular in this work. In the year it was written – ­1968 – they seem to take up a position against its time, against the modern high-tech world, which appears rather symbolically in the insisting mechanical drive of the third and fifth movements. The present world and that of memory fuse in the coda of the fifth movement where the beginning of the first movement is recollected in a casual flashback (Più Presto) and led to an unexpectedly bright conclusion in G major. This gesture of confidence brings the grave, momentous work, which is almost a summary of Reizenstein's aesthetic creed, to a conclusion. While Erich Gruenberg's posthumous edition of the Sonata op. 46, published by Alfred Lengnick, presents a reading which differs from Reizenstein's manuscript in several places and is without a comment, the present recording is entirely based on the composer's autograph.